Bases are compounds which react with acid to form a salt and water as only products. 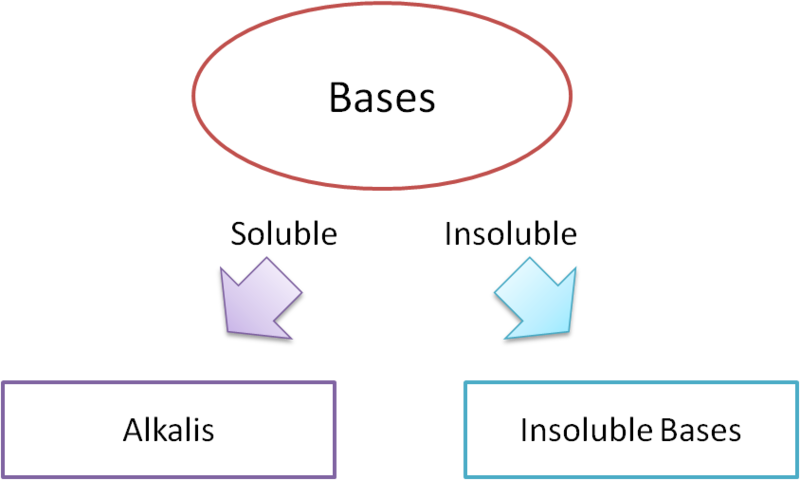 Bases that soluble in water are called alkalis. calcium hydroxide Ca(OH)2 gives Ca2+(aq) and 2OH–(aq) ions. In alkaline solution there are more OH– ions than H+ ions. Alkalis are bitter in taste. Alkalis turn litmus from red to blue. Like acid, alkali can change the colour of litmus. In alkali solution, the colour of litmus turn blue. Alkalis are soapy to touch. pH value is a measurement of the concentration of hydrogen ions in a solution. Alkali has very low concentration of solution hydrogen ion, even lower than water. Hence the pH value of alkali is higher than 7. (Note: The pH value of water is 7. The lower the concentration of hydrogen ions, the higher the pH value. When a base dissolve in water, it will dissociate and form hydroxide ions. The present of the freely move ions make alkali an electrolyte. By nature, ammonia is a covalent compound. Ammonia exists as gas at room temperature. Ammonia gas is soluble in water. Most oxides of metal, especially alkali and alkaline earth metals, are basic oxides. Basic oxides that dissolve in water are called alkalis. reacts with an acid to form a salt. Most non-metal oxides dissolve in water to form acids, and are called acidic oxides. reacts with a base to form a salt. Carbon dioxide which reacts with water to produce carbonic acid. Sulfur dioxide, which does not form the non-existent sulfurous acid but does react with bases to form sulfites. Not all oxide of non-metal are acidic oxide. For example, carbon monoxide (CO) is neutral. The metal oxides that can behave as both acids and bases and are said to be amphoteric oxides. Examples of amphoteric oxides are lead oxide, aluminium oxide and zinc oxide.